February 2016 Cosmetic Dermatology Treatment Specials! Do you want to love the way you look this February? 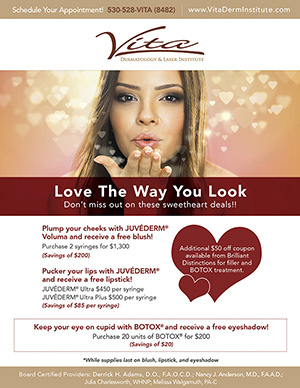 Now through February 29th, 2016, Vita Dermatology in Red Bluff has some awesome specials on cosmetic dermatology treatments such as Botox, Juvederm, and Voluma. With a purchase of some of the packages, you can also get FREE lipstick, blush, or eye shadow! Summer Cosmetic Dermatology Treatment Specials! Are you ready to let your youthful spirit shine through this summer? 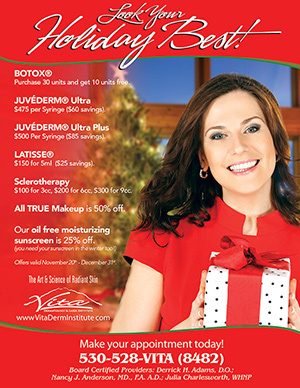 Now through June 30th, 2015, Vita Dermatology in Red Bluff has great specials on cosmetic dermatology treatments such as Botox, Juvederm, Radiesse, Voluma, and Latisse. 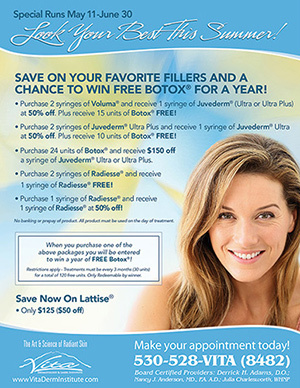 With a purchase of some of the packages, you will also be entered to win a year of FREE Botox®! Have you always thought that Botox was only for women? Not at all! Botox can help men reduce fine lines and achieve a younger appearance as well. 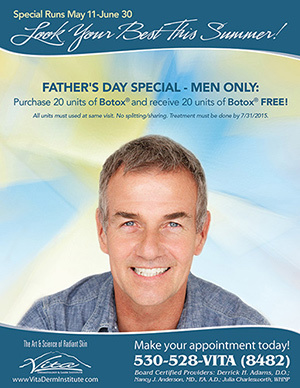 Now through June 30th, 2015, Vita Dermatology in Red Bluff is offering a Men’s Botox Special.